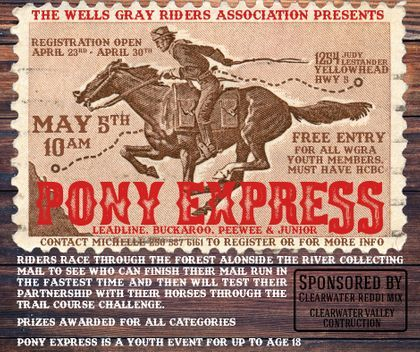 Youth group has been a primary focus for the Wells Gray Riders. Each committee takes pride in the ability to offer something to our Youth at each event and youth specific events. For 2019 we have exciting new events for our youth division including: horsemanship & barrel clinics, fun events such as the Pony Express, Mini Mantracker, Scavenger hunt and even a halloween event! The Gymkhana's held at the UCFI Arena have all age friendly events going on during the days events! Our Youth Coordinator, Michelle, is always looking for great ideas! Get in touch and find out more! Gymkhana has always at least half their entries come from youth participation! Get your kid in on Leadline, Buckaroos and more! 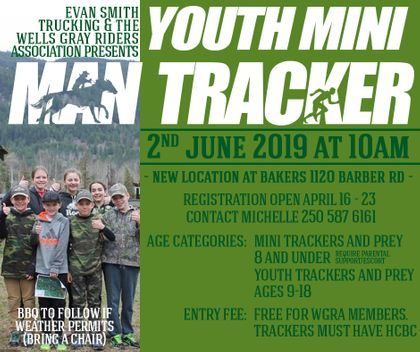 Youth group will have many exciting events throughout the 2019 year, be sure to check our calendar of events on our website and follow the Wells Gray Riders Association on Facebook and Instagram. The Wells Gray Riders Association would like to extend a huge thanks to our Youth Division sponsors for 2019. Without their generosity, none of our amazing events would be possible!